Have you ever realized 1 hour before dinner time that you have nothing planned for dinner? There was a night, for me, like this and boy did I have a break down. With a screaming baby and Pinterest up I determined (desperately) to get something on the table. I threw a piece of frozen chicken drenched in salsa in a pan and cooked it with peppers and onions. I then made corn and a couple types of beans. I made homemade (horrible) corn tortillas and threw in some rice for good measure. By the time my husband got home the kitchen, the baby, the dinner (if you could call it that) were all a big, fat, ugly mess. Despite how I felt towards this mental-breakdown inducing dinner, we had something to eat. By this point I'm sure you are hoping the recipe you came for is not the above mentioned one. Thankfully it's not; but because the recipe I am going to share started from that night's disaster, I though I'd better give the back story. I always make enough for left overs so we had this dinner yet again the second day. 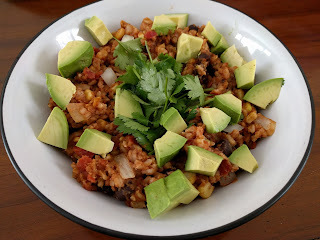 When the third day rolled around I decided to take all the leftovers (minus the tortillas) stir it all together in a pan with tons of Mexican seasonings and get it nice and hot. Afterward I tossed a bunch of cilantro and avocado on it and it became one of our all time favorite dinners. 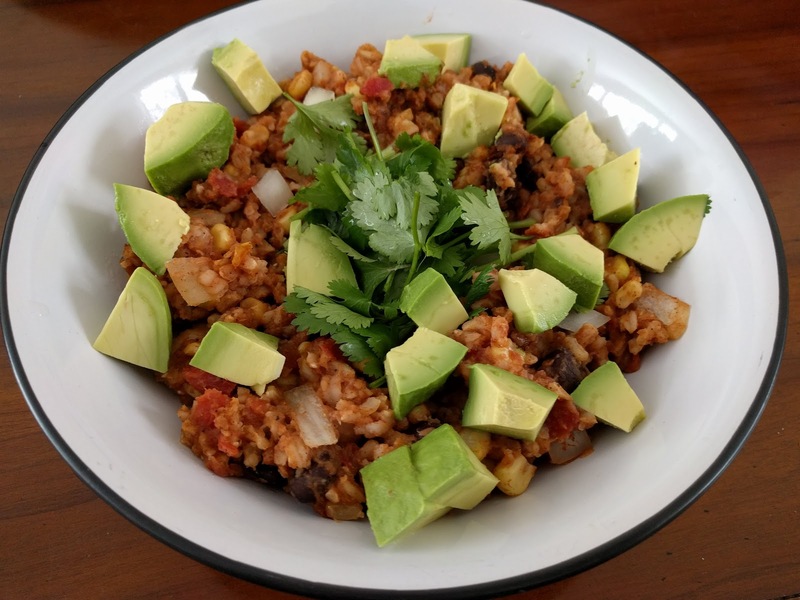 The easiest Mexican flavored dish I've ever made. OPTIONAL: Saute onions and/or peppers in a skillet. 2. Open cans and bags and toss all with the rice to mix it all together. 3. Throw all the seasoning in and mix again. 4. Turn heat up to medium, medium low and heat all the add ins. 5. Garnish to your hearts content with whatever sounds good and is laying around. There you have, the easiest Mexican Flavored dish to save your life.